Name occurring in Psalms lxxxviii. and lxxxix. (in the titles); I Kings iv. 31; and I Chronicles ii. 6. In the last-mentioned passage the Authorized Version gives "son of Zerah." It is not probable that the Ezrahite of Kings, who was famed for his wisdom, was the author of a psalm of the tenor of Psalm lxxxix., which, moreover, must have been written during the Exile, when the crown of the Davidic family was, as it were, broken (Ps. lxxxix. 40). 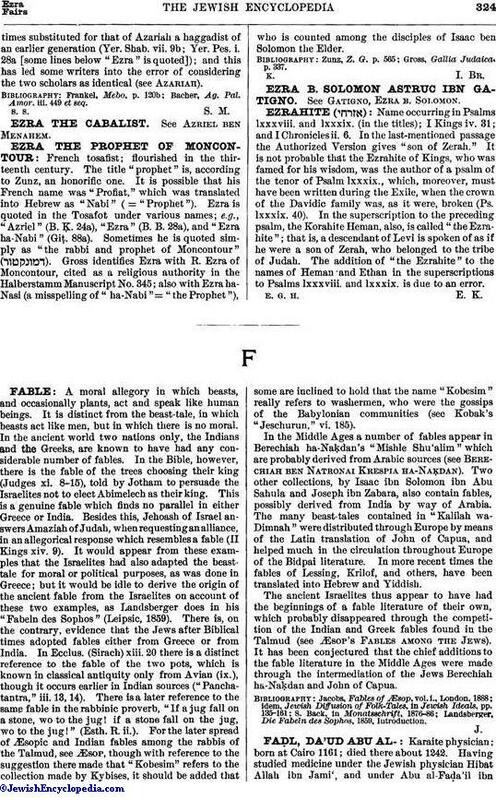 In the superscription to the preceding psalm, the Korahite Heman, also, is called "the Ezrahite"; that is, a descendant of Levi is spoken of as if he were a son of Zerah, who belonged to the tribe of Judah. The addition of "the Ezrahite" to the names of Heman and Ethan in the superscriptions to Psalms lxxxviii. and lxxxix. is due to an error.